LONDON - The Government's decision to allow hospitals to advertise has been thrown into disarray after a ruling by the Advertising Standards Authority. The Department of Health is seeking urgent talks with the ASA after it banned an ad by the NHS North-East spelling out patients’ rights to choose where they are treated. Headed good news – you choose, the ads by Martin Tait Redheads ran in a seven-week campaign. A local GP complained to the ASA that the ads were misleading, challenging their claim that a patient can choose from any NHS hospital. 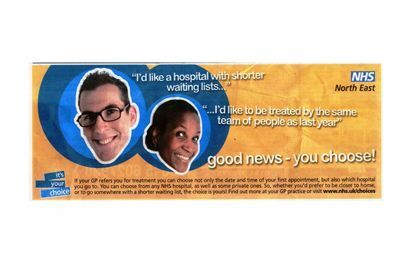 The ASA ruled last week that the ad gave the impression patients could always choose the date, time and place of their appointment for non-emergency treatment. The DoH said: We are baffled and will be taking the matter up with the ASA. People in England have been able to choose where they are treated for more than a year now.